The McLube Division of McGee Industries, Inc. has developed a series of water based release agents for use in the wood fiber composites and panel pressing industry. McGee Industries has over five decades of experience manufacturing and marketing mold release and antistick coatings to variety of industries. McLube products are developing using first-class and top-quality technology coupled with practical experience. The new products that have been developed have proven to perform well in composite wood fiber and panel pressing applications. McLube products are environmentally and operator friendly allowing for multiple parts to be released per application, no transfer to the manufactured material, reduced mold build-up, improved surface appearance and reduced scrap rates. Products will provide a durable bonded colorless film coating that is thermally stable and chemically inert. Products are available for low, medium, and high density fiberboard, plywood, particle board, strand board and structural plywood. Samples are available for evaluation. 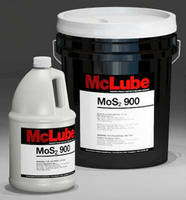 Please contact The McLube Division of McGee Industries, Inc., 9 Crozerville Road, Aston, PA 19014. 1-800-2 McLube (262-5823), www.mclube.com. Info@McLube.com for more information.